Obituary for Leona Dorothea Hefner | Langeland Family Funeral Homes, Inc. Passed away Monday, April 30, 2018 at home. Leona D. Hefner was born June 3, 1916 in Bethune, Colorado to the late August (A.W.) and Mary (Weishaar) Adolf. Born in an adobe house, the third of eight children she grew up on the ranch her father owned and farmed. She attended the Wylde prairie school and graduated from Bethune High School valedictorian, class of 1932. Following the Great Depression, she earned her teaching degree and masters from Northern Colorado State College. Her career began as a classroom teacher, teacher supervisor and principal. Settling in Kalamazoo, she taught third grade at the WMU Training School, met and married Harry S. Hefner in 1946. They began married life as house parents at Walwood Hall, returning to Ernest Burnham Hall with daughters Holly and Lynne. Leona served as resident hall director from 1958-1961. She went on to teach at Portage Public Schools and became head of the reading department. 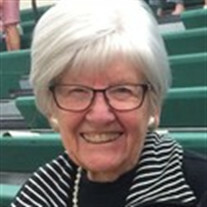 She was secretary for the Michigan Reading Association, president of Homer Carter Reading Council, chair of the Gifted and Talented program for Portage Public Schools and held membership in Delta Kappa Gamma and Phi Delta Kappa. Retiring in 1981, Leona devoted herself to family, teaching at the college level, traveling, gardening, jewelry making, painting, and writing. Her sense of humor and fun loving nature served her well at the Fountains At Bronson where she lived for 27 years. In January she moved to Union City to live with family. She loved spending time with her great-grandson. She will be remembered with love as a wonderful mother, devoted wife, grand/great-grandmother, teacher and friend to many. She is the mother of two wonderful daughters, and two sons-in-law, Holly (Art) Stephenson of Three Rivers, Michigan, Lynne (Tom) Serafin of Union City, cherished grandson Caleb (Ali) Stephenson and beloved great-grandson, Cael Tucker Stephenson, of Three Rivers and two siblings of Colorado. She was preceded in death by husband, Harry S. Hefner (2006), and five siblings. She belonged to the First Presbyterian Church of Kalamazoo since 1947. A memorial service will be held 1 o'clock Saturday, May 12th at the First Presbyterian Church, 321 W. South St. A time of fellowship will be held immediately following the service. Private committal services will be held at Fort Custer National Cemetery where she will rest alongside Harry. Memorials may be made to Hospice Care of Southwest Michigan. Arrangements were made by the Langeland Family Funeral Homes, Westside Chapel, 3926 S. 9th St.